Players with a driving attack will enjoy exploring rosewood’s sweeping tonal range with Taylor's 400 Series Dreadnought which includes some major upgrades. This model features solid Rosewood back and sides with a solid spruce top, performance bracing, white binding, Italian acrylic dot fretboard inlays, a 3-ring rosette, and gloss finish. The Mahogany Neck with bound ebony fingerboard is slightly narrower with a 1-11/16-inch nut, making the guitar more appealing to traditional players who find a 1-3/4-inch neck a bit wide. 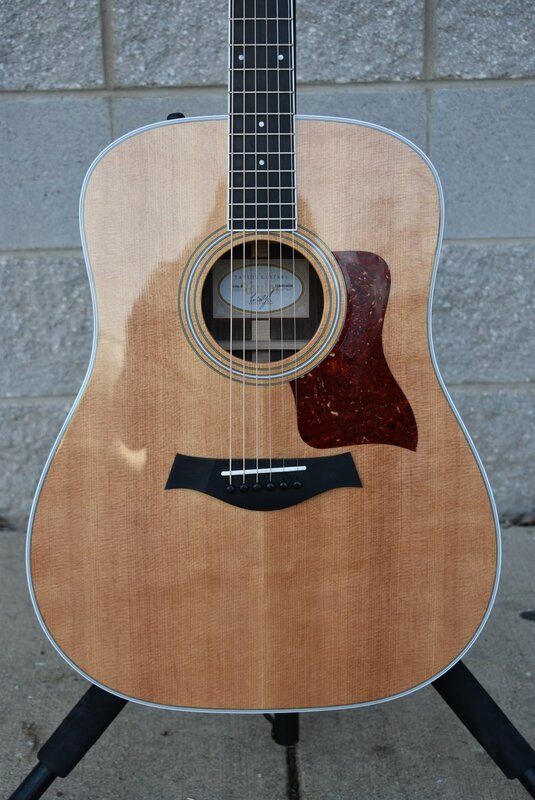 The 410e-R features Taylor's Expression System 2 Electronics to amplify the guitar's natural acoustic tone, and comes in a Taylor Hardshell Case.